Learn the Exeter stem (Stryker) and Gap II restoration acetabular cage (Stryker) for acetabular metastases. surgical technique with step by step instructions on OrthOracle. 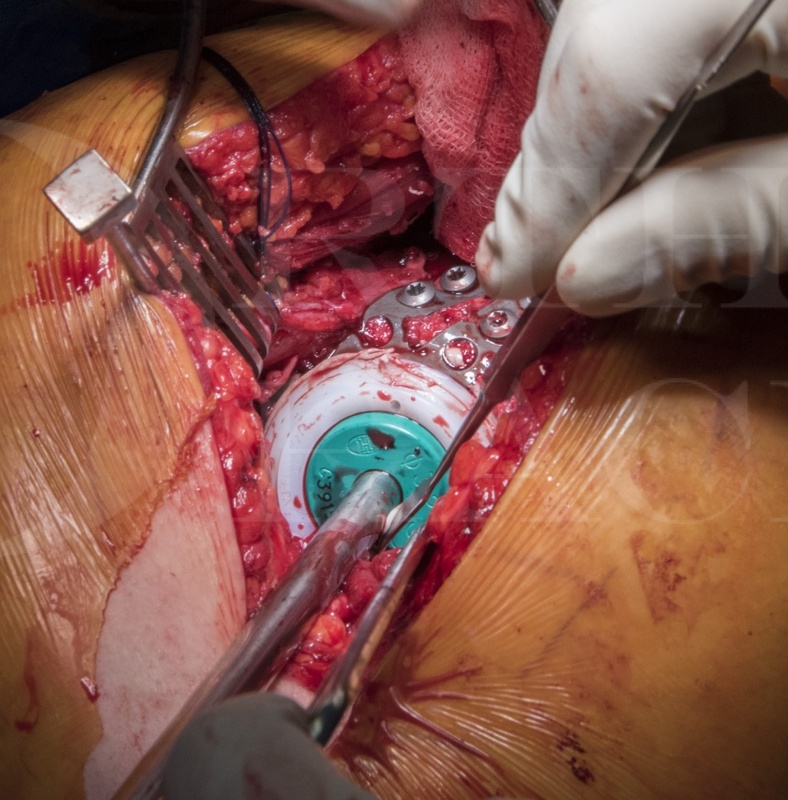 Our e-learning platform contains high resolution images and a certified CME of the Exeter stem (Stryker) and Gap II restoration acetabular cage (Stryker) for acetabular metastases. surgical procedure. A Stryker restoration GAP II acetabular Cup is presented for the reconstruction of an acetabulum effected by metastatic breast cancer. The implant has two superior bone plates which can be bent and trimmed to fit the patients ileum and is made from titanium. The bone plates have screw holes to allow for fixation onto the ileum. An inferior crimping hook allows fixation into the inferior part of the acetabulum and by placing the hook inferiorly to the acetabulum the centre of rotation of the acetabulum is reproduced. Multiple dome screw holes allow the placement of screws into the ilium, ischium and pubis as needed. There is also a superior/posterior lip to the cage which facilitates anteversion of the cage. A cemented polyethylene insert is required to complete the acetabular reconstruction. The femoral side is completed with an Exeter cemented stem.